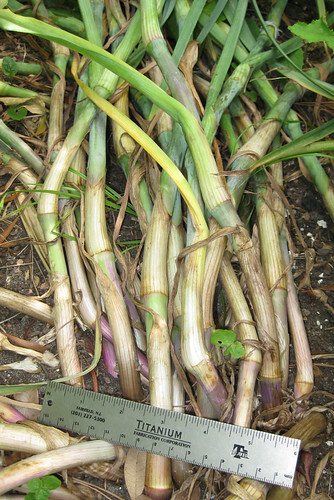 Other uses: the normally blue stamen hairs indicated mutation by turning pink when exposed to radiation. 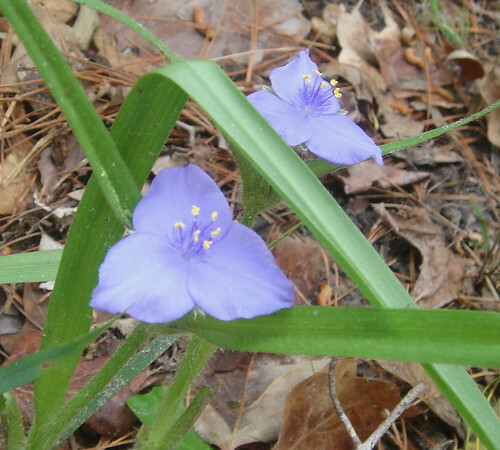 The same effect has since been observed when the dayflower plant is subjected to chemical pollution. 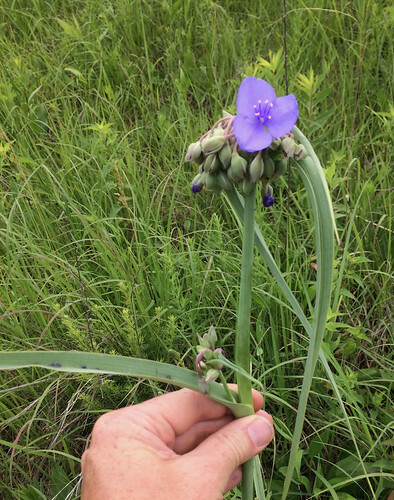 Close-up of mature spiderwort stems. 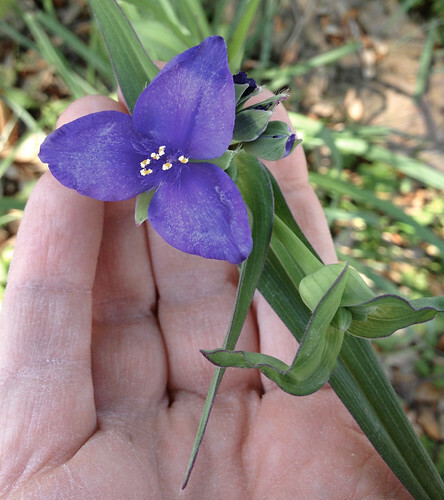 Spiderwort flower, flowerbeds, and stem. 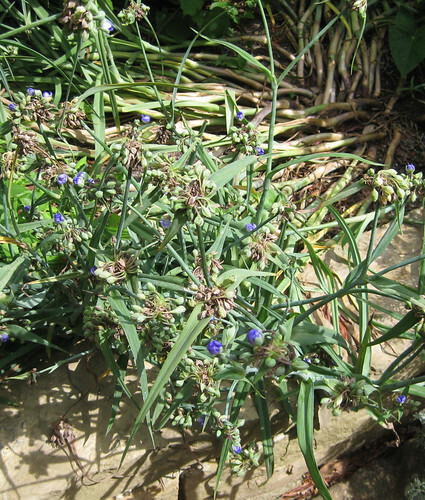 Close-up of spiderwort unopened flower buds. 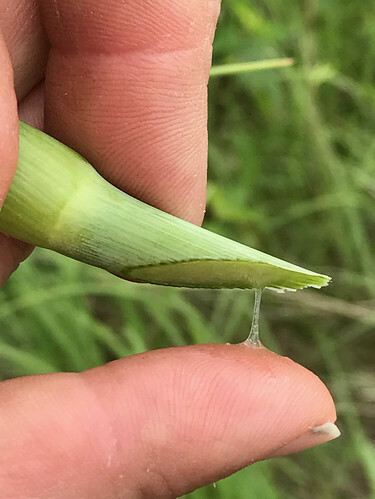 Mucilaginous slime from Spiderwort stem. I love this plant because it is nutritious and can be found in many parts of Texas area almost all year long. Spiderworts seem to prefer shady, sandy soil along streams and ponds but can appear anywhere it's moist, even low spots in sunny fields. 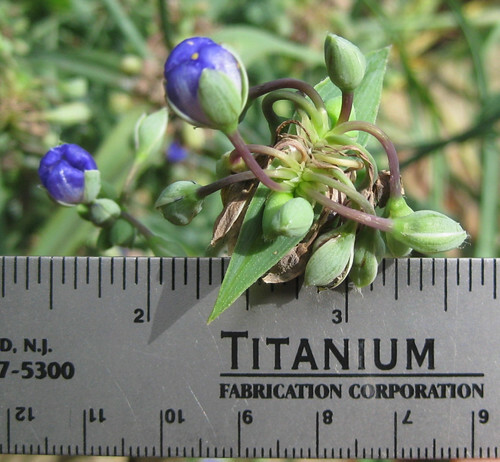 They grow upright on pencil-thick stems, too about the height of two feet. They'll have a cluster of a few opened flowers and many unopened flower buds. Each flower opens in the morning and rarely lasts beyond noon. New flowers appear each morning, all spring, summer, and fall, even lasting into the winter if the weather is mild enough. 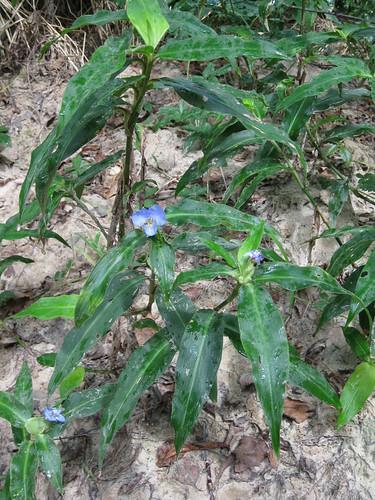 The leaves are long, tough, slightly rough, with a parallel venation. Looking closely at the leaves, you'll notice they clasp/wrap around the stem with a bit of the leaf running down the stem. Hard frosts will kill it back to the ground but it'll be back and ready to eat in about two months. 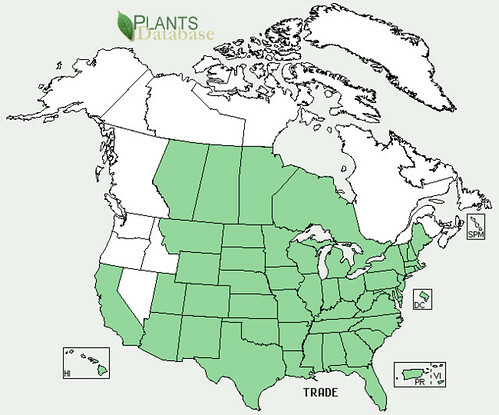 All parts of the plant are edible but due to the overall toughness of the plant, I generally only eat the flowers and flower buds. 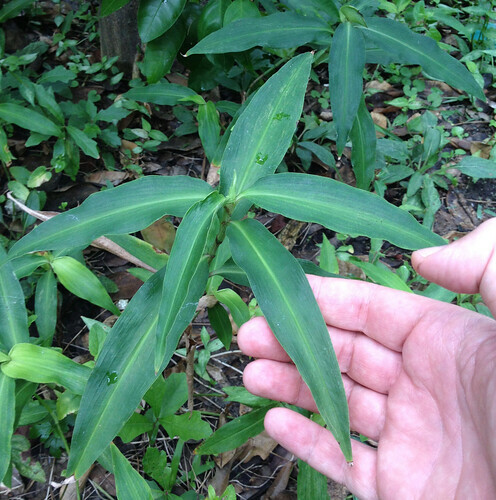 The sap of these plants is very mucilaginous, similar to okra and aloe vera. Rubbed on minor (1st degree) burns this sap brings relief. Also like okra, it can be used to thicken stews, just chop up the stem really fine. The longer the bits of stem are simmered the softer they'll become.